Ferguson is a mess. If journalists can be arrested for no reason whatsoever, (hauled out of a McDonald’s, with their press credentials clearly visible) just imagine how average citizens of Ferguson are being treated. Mistrust is at the heart of all that is happening there. Police are unwilling to answer even the most basic questions about the Michael Brown case. Only three of Ferguson’s 50-plus police officers are African-American. Seventy-percent of the population is African-American. You do the math. Yesterday was a day of peaceful protests in Ferguson. It was a de-escalation on the part of the citizens there. The police could have responded in kind, by de-escalating the scope of their SWAT-like response. They did not do this. So, yes, there’s a racial component to what’s happening in Ferguson. But everything happening there is greatly exacerbated by the militarization of local police. 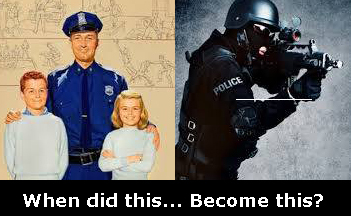 First, the federal government gave grants to fight the “War on Drugs.” Then, they gave grants to fight the “War on Terror.” Police forces in peaceful suburbs now routinely train and use SWAT-style weapons for the hordes of Islamic terrorists descending upon them (turn your sarcasm detectors on). I point to these two additional resources. First, this report from the progressive ACLU. Then, a similar report from the conservative Cato Institute. The militarization of local police in America brings fear to everyone. It’s a big part of what’s driving the fear of African-Americans on the streets of Ferguson. However, it’s also a big part of what drives the fear of White people espousing “Open Carry” here in Texas. Militarized police raise fear and anxiety in a cross-racial way. Ferguson is not Baghdad. It’s not even Cairo. Our citizens have rights. Our police have responsibilities. The police have made many tactical mistakes in these past few days. And, most importantly, our citizens are not nails to be pounded by a SWAT-team hammer.